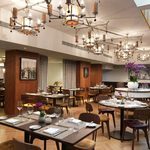 There is a very particular feel to the new hotels and restaurants forging a revival in the once-dead area between Trafalgar Square and the Thames embankment, until recently the exclusive province of government mandarins. These Victorian buildings with their high ceilings and neoclassical columns are both blessed and cursed by a grand monumental architecture reminiscent of old London banks. It comes as a surprise to learn that the huge and distinctly bank-like Corinthia was actually purpose-built as a hotel way back in 1885. As the Metropole, it was a prestigious hub for socialites, hosting everything from debutante balls to midnight cabarets mobbed by the rich and famous. This heyday came to an end with the Great War, when after being requisitioned by the government, Victorian columns were boxed in and cornices were torn out in the name of modernisation. And inevitably, given its proximity to the seat of government in Whitehall, the once-grand hotel was sold to the state in 1936 to become an annexe of the Ministry of Defence. Although its colourful history persisted – POW escapes were organised from here during the war, and Churchill looked out of a window to watch people running into the streets in celebration on Armistice Day as Big Ben tolled – the building was decommissioned in 2007. The following year it started its long journey back to the future, now standing amongst the newest five-star hotel offerings in the city, directly descended from one of the oldest. Fittingly for the 21st century, the original 600 rooms have been reconfigured to make less than half that number of spacious rooms, some spread over two storeys, others boasting turrets and even private lifts. The luckiest guests enjoy views of the river and the London Eye; others, like me on a rainy autumn night, may find the inner courtyard views a bit gloomy, and their rooms short of natural light. 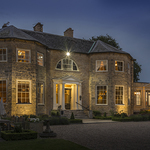 world-class cuisine, a high-design bar, an ESPA wellness centre where acupuncturists, osteopaths and physiotherapists practise alongside beauty therapists. The whole ground floor is given over to a large lobby lounge fielding enticing displays of teatime goodies and dominated by a chandelier comprising 1001 crystal baubles. 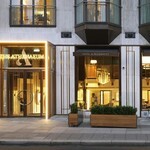 The hotel also boasts the only branch of Harrods outside Knightsbridge and Heathrow. Grand? Yes. Impressive? 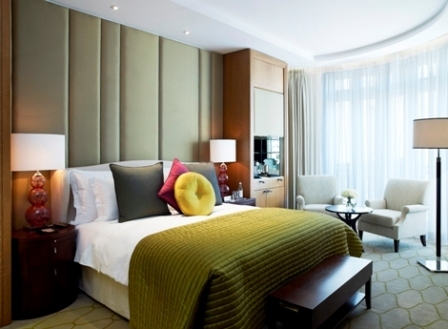 Certainly – and full marks for the location, just steps from the four-line Tube station at Embankment as well as a three-minute stroll from Trafalgar Square. But the service is also very grand, a tad impersonal – and you can’t quite shake that feeling of having spent the night, albeit sleeping like a baby, in an incredibly grand and austere ancient London bank.